The latest visualization tool (or toy?) from NASA is a work of art: Called Eyes on the Solar System, this 3D rendering of our cosmic neighborhood lets you explore planets, asteroids, and witness spacecraft encountering comets and moons. Powered by the Unity 3 gaming engine, Eyes provides a stunning view of your favorite celestial bodies from a satellite’s perspective. Looking for inspiration of where to visit? 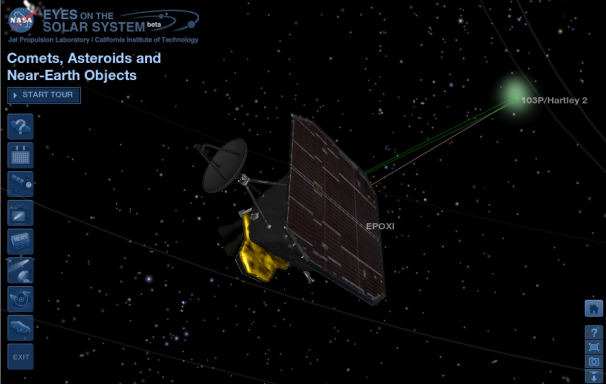 Check out the Cassini flyby of Saturn’s moon Titan, or any of EPOXI’s encounters with comets (click the “DESTINATION” panel in the lower left). Other panes let you control the date and time, the speed and rate of any encounter with a planet, multimedia (videos and spacecraft images), as well as what objects you’re looking at and how much they’re illuminated (“VISUAL CONTROLS”). How does Eyes on the Solar System compare to Google Earth or Sky? First off, Eyes runs entirely in your browser (only requiring installation of the Unity plugin), and contains a ton of mission data and information that you won’t get from Google. 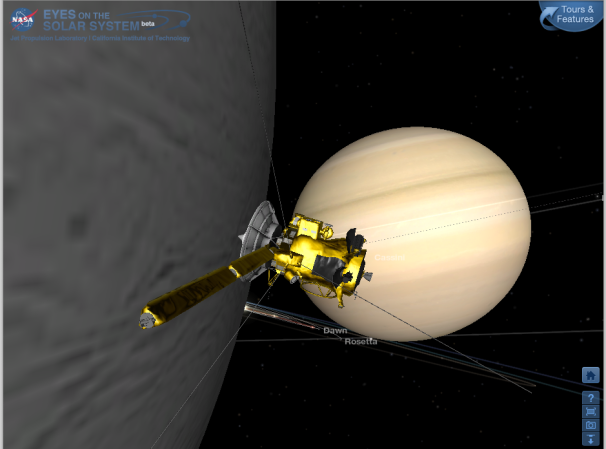 Eyes incorporates spacecraft pointing and orientation information direct from NASA, so you can see exactly how Cassini flew past Saturn’s moon Encealdus during its 2008 flyby. Our source at NASA tells us that they’d love to be using HTML5 to power Eyes on the Solar System, but that adoption of that standard across browsers hasn’t been very consistent, so don’t hold your breath on HTML5-hitchhiking through the solar system. Eyes requires very few system resources, and will do just fine on a five-year-old Windows box. The total amount of data is around 10 gigabytes, but the simulator only downloads imagery as needed, meaning you can start exploring as soon as you get to the site. What’s your favorite thing you’ve discovered in Eyes on the Solar System? Do you have a favorite mission flyby? Let us know in the comments, and never stop exploring. Alessondra Springmann is at the 42nd annual Lunar and Planetary Science Conference in Houston, TX this week. You can follow her on Twitter (and make requests about what solar system topics you’d like covered).